Not many Americanos know that December 12 is Virgin of Guadalupe Day. But then it's a Mexican holiday, not an American one. South of the border they don't make a big deal out of Cinco de Mayo, so there. And Guadalupe Day is a new, twenty-first century holiday, started after Juan Diego, the guy who saw her, talked to her, and had her image appear on his tilma was made a saint. That was back in 2002 (the sainthood, not the vision) – I have a clear memory of a news clip with Pope John Paul II, on the verge of death, nodding off as Mexican children sang “Cielito Lindo” in celebration of the canonization. I've been to the futuristic Basílica de Santa María de Guadalupe. I've seen the image on the tilma, or at least I saw what I could as I stood on the airport-style moving sidewalk in front of it. It looked like a painting to me. Still, there's no denying the power of the Virgin. My grandparents had a statue of her in their living room. In Mexico she's a right-wing symbol. Up here in El Norte, the lefties bring her along on their marches. Gangsters tattoo her on their bodies. Every day I see her on cars and clothing. The big question is, just what is she? She's not the Virgin Mary. Unless of course the Mother of God was a Mexican Indian girl somehow transported to the Middle East long before Columbus sailed the ocean blue. It may be that I'm an Atomic Age baby, but she looks kind of sci-fi to me. Take the classic film, La Virgen Morena (1942), that Spanish-language television used to show before Easter, in the pre-St. Juan Diego days. We got to see Aztecs and conquistadors in epic battles with a look similar to the Buster Crabbe/Flash Gordon serials. When the Virgin appears out of some Martian-looking cactus, theremin-like electronic tones were heard. 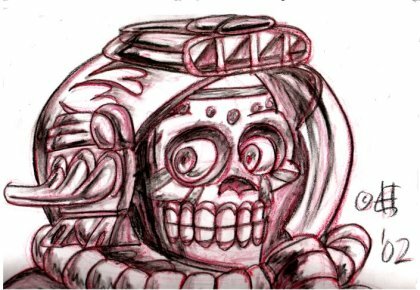 If you were totally ignorant of Mexican history, and didn't understand any Spanish, you'd think you were watching an interplanetary adventure. And I'm not the first to make this connection. In his book, Passport to Magonia, Jacques Vallee points out that UFO stories have a lot in common with tales of fairies and other such entities of the past. He points out that story of the Virgin of Guadalupe “reminds us in several important aspects of the many tales of fairies,” the way that modern children's stories of meeting beautiful ladies from spaceships are similar to ancient tales of meeting with fairy queens and princesses. 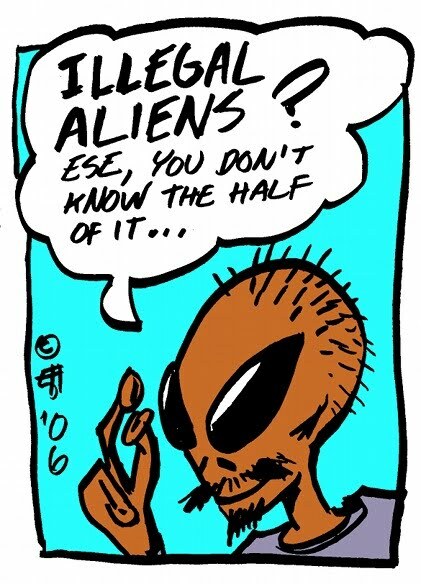 This is not to say the Virgin of Guadalupe is really a space alien, a fairy, or a witch (though, the resemblance to Glenda, Oz's Good Witch of the West, is uncanny). We're probably talking about something people have experienced since before civilization, that our perceptions aren't capable of fully processing. Every generation and culture fills in the gaps with their own experiences. But we still don't really know. Ernest Hogan's story “Radiation is Groovy, Kill the Pigs” is available in the anthology, 2020 Visions. La Virgen a alien? What are you smoking? I loved the Arthur C. Clarke quote. There are many mysteries and there are many questions but most answers fail after time. It is good to remember these mysteries that our ancestors experienced. It is good to remember that we still live in a mysterious world.